Thanks to RJ Shiri and DJ (Damodhar) I have experienced close encounter with legendary lyricist Sirivennella Sitaramasastry (SSS), this weekend in Dallas. It is no brainer that I have had an enlightening experience interacting with him, which is further fuelled by additional research that have I have done in last 48 hours to get more insight into SSS garu. I have always been enthusiastic of high quality lyrics and aficionado of pure (swachhamaina) Telugu language. However, this weekend rendezvous with SSS garu will change me forever, how I listen to the songs and further accelerate my appreciation of telugu songs with good “sahityam”. Here is my weekend blog on my interactions with the legend, written on-board American Airlines, enroute to Philadelphia. I have included few snippets and snaps that I have captured with his permission, along with a tiny glimpse from the concert. Telugu literature enthusiasts and music aficionados who missed the event in Dallas, it’s “too bad” for them. Rest of you can catch him in the town nearest to you. It is one of a kind of a concert. When I landed in DFW on Jun 24th, I saw a FB note from RJ Shiri “The BEST moment of my day!! And the Thrilling feeling ever!!! Sirivennala seetharama Sastri the renowned Telugu lyricist talked with me on the phone and said ” shiri all that you shared on the video and radio, how did you know about me so well amma. Shiri you are my daughter now”. Thanks a ton Damodhara Reddy Garu!!! I’m still feeling awed!! !”.Then I saw note from Shiri on Whatsapp pleading me and then threatening me on the phone to stop at her place for Dinner, before I head to hotel. 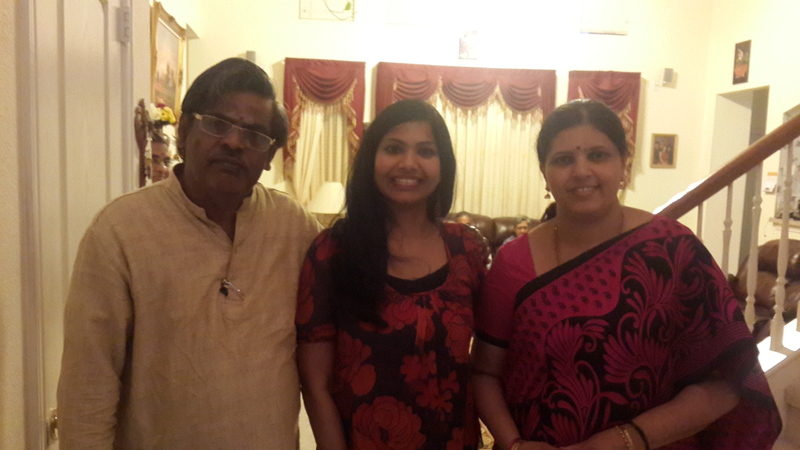 During that Dinner, I met Damodhar and we three discussed plans to meet SSS garu. Shiri and I went to place where SSS garu staying at his cousin’s residence in Coppell. As soon as we entered his residence, he wished Shiri and said ‘my daughter is here”. He started chatting with us as if knew us a for a long time. It was extremely endearing and humbling experience to see him see him so grounded. He enquired about us in detail and listened attentively. Shiri asked him several trivia questions and while trying hard not to be on cloud 9.Shiri asked him, who inspires him most. He said, “My father” and then his never-ending penchant for inquisitiveness. He said, being inquisitive and being questioning is his inspiration. He discussed about his childhood and then recited a song. I asked him which movie is the song from me. He gave me a soft verbal slap and said, “how does it matter”. Why do you need to associate a song with a tune and a visual from a movie? He said, you would truly own the song as if it’s yours, only if you associate it with from external music and visuals from associated movie. That was my “Buddha “moment. I have realized that I used to pay attention to lyrics of a song only when I was listening on the radio, and more so it was when sung by someone at a party with no associated Karoke or soundtrack. SSS garu said, each of his song has a built-in tune and visual. No external help is needed. In fact external entities (music and visuals) actually distort the intended meaning and experience that are you meant to have. He talked about his two sons and his daughter. Mrs. SSS garu also with him during our interaction, and intently listening to him. She must have seen him repeating the same for thousands of times already. But SSS garu was chatting as if this is first interaction after his first Nandi award. I went back to the hotel that evening, and Googled on YouTube for all songs penned by SSS garu. I never paid attention to know to the author of my favorite songs for last 25 years. I was shocked to see that over 90% of my favorite songs have been penned by SSS garu. I felt happy and sad that I did not know all of this when I met him just few hours ago. I called Shiri and said that I regret not knowing about him prior to meeting him, and wished that I can meet him. Later that evening, I shared my experience in Whatsapp to my colleagues. Prasanna replied back saying SSS is one of the 3 persons he is dying to meet in his life and said I would be his hero, if I can get one-on-one for him with SSS garu. Raj and Ravi said, they both are die-hard fans of SSS garu. I called Damodhar and requested him to set up another rendezvous with SSS garu. He spoke in details about importance and nuances of appreciating good lyrics and sahityam. Later Prasanna had a one on one with him. Raj joined and had an exclusive one on one with him. He asked us to wait some more time, and came for a walk in the neighborhood. He chatted with high levels of enthusiasm, and recited many verses. Again stupidly we asked, “which movie is this song from”, and got a soft spat again in an affectionate way. We were surprised to realize to that we were so ignorant of great lyrics that he has penned, due to distraction from music and visuals in the movies. As we ended our conversation, he said, “Interaction with folks like you, make me want to come to Dallas more often”. It is a flattering statement. He said, “My interaction does not come FREE. You have to pay for it, by sharing your e-mail address to me, and being in touch with me”. He talked about the website which is followed his enthusiasts where they discuss and analyze the philosophy embedded in his songs. I went to the website, and savored in-depth interpretation of some of great songs that I have been adoring for decades now. One of them is listed at the end of this blog. I feel some of his songs definitely needs to be part of curriculum in our school books. Instead of still focussing on Vemana poems, we need to teach young generation on how to interpret and appreciate good literature, and learn meaning of life from some of his songs. Some of his songs can be used as great case studies and teacher can have students present their own interpretation as classic assignments. The more I read about Jagamantha Kutumbum song, the more confused I get, and more enlightenment I would receive too. It is so deep, so simple, and yet so philosophical. Same with so many other songs. He won the Nandi Award for Best Lyricist 10 times and Filmfare Award for Best Lyricist – Telugu 3 times. 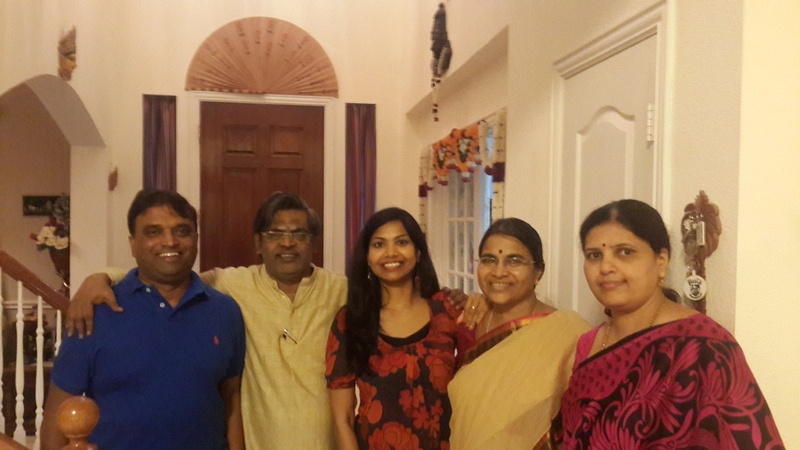 Sita Rama Sastri debuted with writing songs for K. Viswanath’s Sirivennela. The songs in the movie were so phenomenally popular that the name of this movie got tagged to his given name. The songs of this movie are wonderful and rich in meaning that each of the songs is remembered to this day as landmarks in Telugu film-music. A particular highlight of the movie is the song “Vidhata Thalapuna”, sung by S. P. Balasubrahmanyam and P. Susheela. The song is about Aum, the most sacred syllable in Hinduism, from which the Veda traditions originated. He also made record by winning hat-trick Nandi Awards in 1986, 1987 and 1988 and became the first one to do so. His next major breakthrough was “Rudraveena“. The lyrics for songs like “Tarali raada”, said to have inspired many people. His lyrics for the film “Gaayam” were considered as a path breaking effort and gained him, his fourth Nandi Award for Best Lyricist for the song “Surajyamavaleni”, in 1993. His lyrics got extremely positive reception and won him his seventh and eighth Nandi Award for Best Lyricist for the songs “Ardha Shatabdapu” (Sindhooram) and “Devudu Karunistadani” (Prema Katha). “Jagamantha Kutumbam” (Chakram) got exceptional reception with “Aakasam Thakela” winning him, his first Filmfare Award for Best Lyricist – Telugu and “Jagamantha Kutumbam” winning him his ninth Nandi Award for Best Lyricist. He is considered as one of the greatest lyricist in Telugu Film Industry and is often regarded as next best to “Aatreya“, who is considered as the best ever Telugu Film Lyricist. To know more about SSS garu, I encourage you to read his interview, which easily may take about 2 hours to savor all the details. I felt his story makes a great case for a great movie to be made in future. If you just have 7 minutes, I would encourage you to watch Director Trivikram’s ode to SSS garu. Sai, Don’t know how but it happened to read on my birthday, today. Thanks a lot. This is a nice gift.